Should you buy bonds to save capital gains? The lock-in period of section 54EC tax-saving bonds has increased from 3 years to 5 years. Should you still prefer them over other investments that give better returns? In the Union Budget 2018, the finance minister proposed to increase the lock-in period of investments in capital gain tax exemption bonds (under section 54EC of the Income Tax Act, 1961) to 5 years. In the Union Budget 2017, the government had said it would introduce more financial instruments to save tax on capital gains. However, instead of new products, the present lock-in period of 3 years for 54EC bonds has been proposed to increase to 5 years. Given that the lock-in period or tenure of an investment plays an important role in deciding whether it makes sense to invest in or not, let’s look at whether a longer lock-in period could deter investors from investing in these bonds to save taxes. Also, if one does not invest in them, what are the other options for planning your capital gains? Long-term capital gains from transfer of capital assets like real estate, jewellery, and bullion—if invested in capital gain bonds specified under section 54EC of the Act—provide exemption from tax. You need to invest in these bonds within 6 months from when the capital asset was transferred. 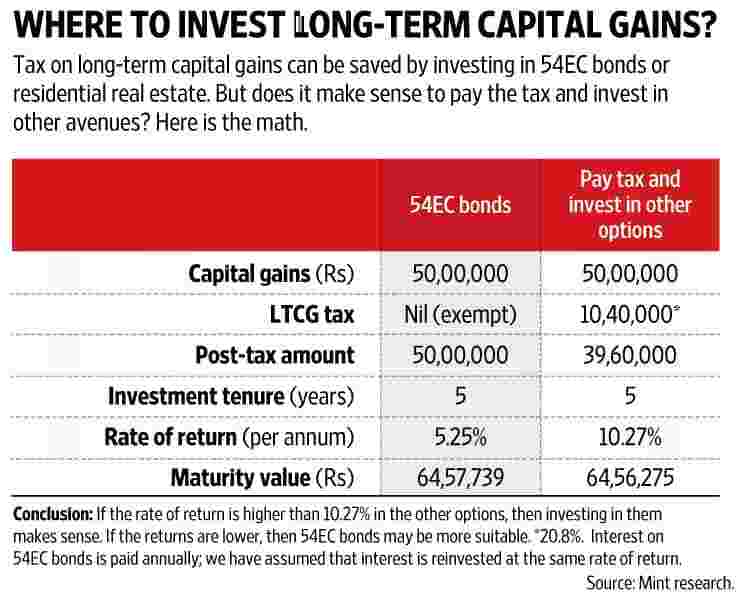 The maximum amount of capital gains that you can invest in these bonds is Rs50 lakh. However, in case of jointly held assets like real estate, each owner has a separate limit of up to Rs50 lakh for investing in these bonds. Currently, the bonds enjoying this benefit include only those from the National Highways Authority of India and the Rural Electrification Corporation Ltd. Both offer a rate 5.25% a year. The other option for saving tax on capital gains is to reinvest the capital gain in a residential property. Unlike tax-saving bonds, there is no limit on how much you can invest in a house. However, you can buy only one property with the capital gain. The new house can be bought 1 year before transferring the older property or 2 years after the transfer. If you want to construct a property, it should happen within 3 years of transfer of the older property. Some experts believe that real estate may be a better option than tax-saving bonds. “At present, the real estate market is close to its bottom. I expect it to start recovering in the next 12 to 18 months. And in the long term, say, 5 years from now, putting together rental yield and price appreciation, we can expect a return of more than 5.25%, maybe somewhere around 6.5% or more," said Sahil Vora, managing director and founder, Sila, a Mumbai-based real estate services company. But “not all properties can provide you such returns, property choice is critical," added Vora. While properties could be considered for investment, “they have to be considered keeping your asset allocation in mind," said Lovaii Navlakhi, a certified financial planner and founder and chief executive officer of International Money Matters Pvt. Ltd. However, a major problem with real estate is that it is not easy to liquidate and its transaction costs can be high. Though both the options (bonds and real estate) help in avoiding capital gains tax, the question now is whether it is worth investing in these options or should one pay the tax and invest in other options to get better options. In case you decide to pay the LTCG tax, it will be at the rate of 20.6% (from AY 2019-20 it will be 20.8%, due to higher cess) but you will get the advantage of indexation. Let’s say even after considering indexation, you make a capital gain of Rs50 lakh. Now, if you invest it in 54EC bonds, it will fetch you a return of 5.25% (which will be taxable at your slab rate) and also lock your money for 5 years. After 5 years your investment would be worth about Rs64.58 lakh. “The combination of an extended tenure and a low interest rate on these bonds may drive taxpayers to explore investment avenues with better returns on their capital gains," said Prateek Pant, head of products and solutions, Sanctum Wealth Management Pvt. Ltd. The issue remains, what other options are available? If we consider other fixed-return options, there is the Government of India 7.75% Savings (Taxable) Bonds, 2018. But investment in such bond will not help as—after factoring in the tax implication—the returns from these bonds will not be able to match that of the section 54EC bonds (see the table ‘The other options’). Besides, the maturity period of these bonds is 7 years. You could also look at mutual funds, because in the long run, returns from them tend to be more tax-efficient. But you should note that their returns are not guaranteed and to generate better returns than section 54EC bonds, these investments would have to return at least 10.27%, pre-tax (see the table). In the last 5 years, average pre-tax return from debt and equity mutual were about 8% and 12% respectively. Moreover, returns are not everything. If you invest in 54EC bonds, then you “need to take into account the complete lack of liquidity for the entire period of 5 years," said Pant. “Client goals are an important factor in determining which option to choose: how important is liquidity, what asset allocation will drive the returns, is it aligned with the risk profile and risk required to meet the goals?" added Navlakhi. Considering all these factors, if you want to avoid market risk and if your capital gains from sale of assets are not allied to near-term goals, you may prefer to go choose to invest in 54EC bonds. However, if you have a longer investment horizon and a higher risk appetite, or if you need even a part of the money for near-term goals, you should consider paying the tax on your capital gains and evaluate other investment options.